« What are Pro-Gun Parents Afraid Of? From the unprofitable Breitbart site, Big Government. Since I’m from the future, I can tell you that there will be more of this. This issue of “civic participation” is a request for an equal time for the pro-gun message. If they don’t get it? Lawsuits. 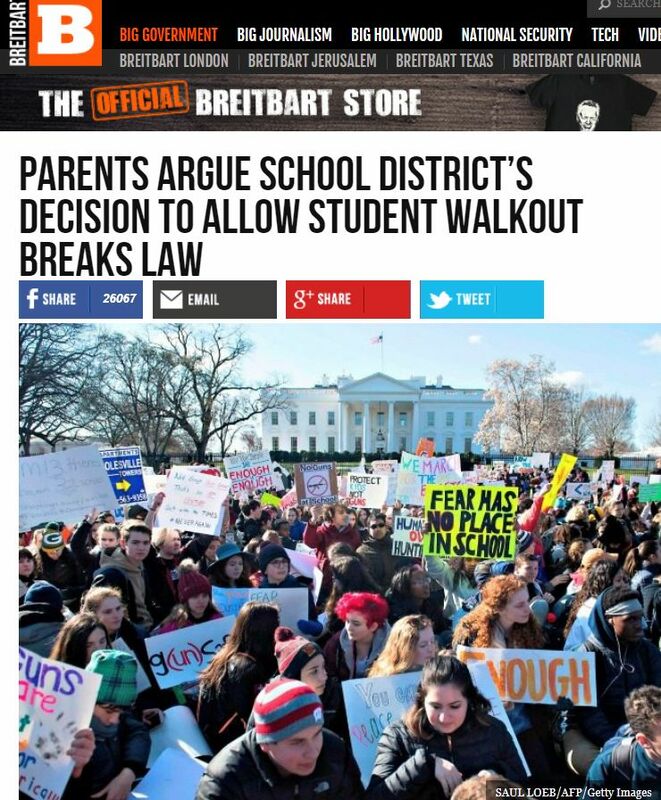 The school in question did a good job responding to the threats, pointing out what the walkout was, a student initiated remembrance, vs how the group wanted to position it, a political event pushing for gun control. But that explanation will be disregarded as ‘legal mumbo jumbo’ by the aggrieved parents and they will keep pushing. The pro-gun parents will suggest the school districts hold some kind of “educational” event in exchange for dropping the threat of litigation. Be on the lookout for these gun-friendly programs coming to your schools. Don’t let them go unchallenged! Yesterday I listened to The UnPresidented Podcast hosted by my friends Cliff Schecter and John Aravosis. They were talking to Shannon Watts, the head of Moms Demand Action, about the progress they have made. At 7:25 she talks about their successes One type of success that people don’t see involves constantly knocking down hundreds of BS bills from the gun lobby. I know how much energy it takes to keep blocking the NRA’s legislative work. Now school districts will be getting pressure from the pro-gun people to implement their solution–more guns in schools. The people on the school boards and in school districts need to hear from parents who don’t want more guns in schools. I talk to people who see the whole concept of armed teachers as so absurd and dangerous they think it should go without saying. I tell them. “It needs to be said.” Say it forcefully, repeatedly and with a preponderance of evidence. I also don’t want more armed police in schools. Not everyone thinks that, but I do and I have multiple reasons why. I hear people pushing them as an option, “everyone agrees on.” No. There are other options. I talked to Michael Brooks on the Majority Report about some of the ways to fight this. All methods will be needed because the people who want to arm teachers have already convinced the legislators to start the money train rolling. Personally I’m tired of the slaughter lobby and their supporters pushing us around legislatively, economically and personally. We can stop them. It’s a fight for our lives.